Our congratulations go out to the Pace 2017 International Environmental Moot Court Competition team that placed as a top two finalist in the North American Regional Rounds, February 3-5 in Washington D.C.! The competition is hosted annually by Stetson University College of Law. This year’s competition problem involved a dispute submitted before the International Court of Justice, relating to ocean fertilization and marine biodiversity. Returning team members, James Patrick Logan (3L), Conor Strong (3L), and Leigh Wellington (3L) proudly represented Pace Law School at the competition. The team was coached by Cassandra Castellano (4L). During Saturday’s preliminary rounds, Pace won all three arguments. Conor Strong (3L) received the prestigious award for Best Oralist of the Preliminary Rounds. The team advanced to Sunday’s final round where they placed as top 2 finalist in the North American Regional Rounds. 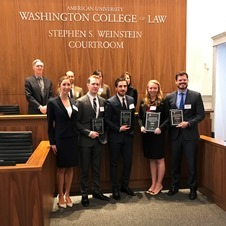 The team was honored to represent Pace Law School and bring home several awards for the second year in a row! Congratulations Patrick, Conor and Leigh on their incredible performance and dedication over the past six months. Post written by Cassandra Castellano (4L).